I was in the field this evening before dark, mowing. Jilda stepped to the back garden gate and waved me in. Coasting under the pear tree, I cut the engine. The engine ticked as I slipped off my gloves and dust mask. "Jordan brought us a gift," she said. When I came into the yard, Jordan was on the porch and he had something in his hands. As I got closer all I could see was the smile on his face. Once on the porch, I got a good look at what he was holding. It was a solar powered, bicycle light. Yard Art. I love Yard Art. He had to demonstrate that the light on the front of the bicycle worked and was powered by a tiny solar cell under the seat. The wheels were windcatchers. 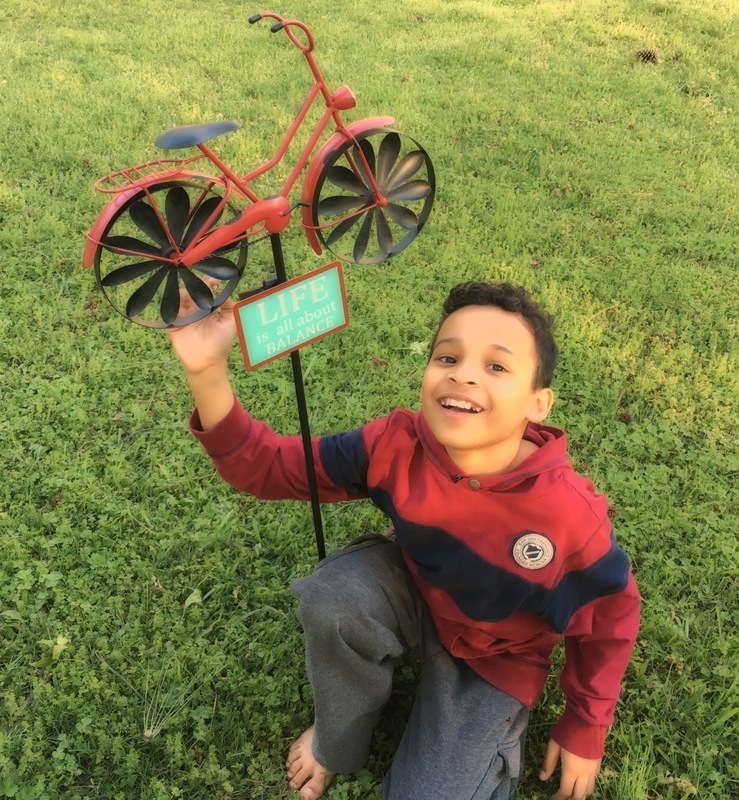 It seems he was with his Nana shopping this afternoon and saw the Yard Art and wanted to buy it for us. He knows we buy him things all the time and he wanted to give us something. The gesture actually put a lump in my throat. Jilda and I both told him it was the BEST GIFT EVER!" I snapped a picture of him demonstrating how it works. Very nice, I can see how that would be a gift to treasure. I was just thinking recently, it's time for a "Jordan moment." No matter the gift, his intention is priceless. Lump-in-throat, indeed! Gotta love that kid. I don't know why, but I especially like that he is barefoot. Definitely a lump in the throat, sweaty eye moment. What a thoughtful gift and what a lovely kid. Definitely a wonderful gift, but the gift of that boys smile is priceless for sure ! I can only imagine the feeling. GREAT. He is a thoughtful guy, and man is the dude growing! What a nice break from mowing! Such a sweet boy. I love hearing about your special relationship with him. Jordan has excellent taste. I love the bicycle. You can't help loving that child. I love it! What a sweet kid!